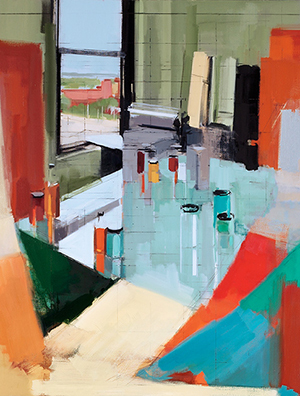 BOSTON, MASS.- Peri Schwartz uses her studio as her subject matter. In the studio, she creates stage sets using books, bottles, and the architecture of the space. She is constantly arranging, re- arranging, adding, and subtracting until the configuration is right. These still lifes are simply a jumping off point for Schwartz. While her finished paintings resemble these complicated arrangements, they teeter on the edge of near abstraction. In the catalog that accompanies the exhibition, John Seed, a professor of art and art history at Mt. San Jacinto College in California, interviews Schwartz about her work. He asks, "How do you achieve a balance between abstraction and representation in your work?" Schwartz answers, "My teachers at Boston University gave me a great training in working from the model and observing directly from life. They also taught me how the masters used their subject in an abstract way. I never was happy inventing a subject and don't like using photographs. I was left with having to work directly from something. I try to take whatever subject I choose and turn it into an image that has both a sense of reality and abstraction. As I mentioned, I move things around continuously, which gives the paintings a visual history. As I get closer to finishing the painting I make decisions that are not necessarily realistic. I might leave an object or shape in the painting even though it is no longer in the setup." Seed notes, "Peri Schwartz is a New York artist whose paintings, prints, and drawings focus on composition and the interplay of color, light, and space. A formalist who has a musical sense of pictorial harmonies, Schwartz's compositions get their rigor from the presence of an implied grid, which she offsets and punctuates with painterly gestures and harmonies of color and value. Her most recent oils - studio interiors and still lifes of translucent bottles and jars -- have the expressive vitality of perfectly executed chamber music. Schwartz's works move between representation and abstraction in a way that allows her the expressive freedom she needs to make each picture resonate and achieve its own 'rightness.'" Peri Schwartz's work can be found in many public and museum collections including the British Museum, the Museum of the City of New York, the Corcoran Gallery, the Fogg Art Museum, the Museum of Fine Arts, Boston, the Bibliotheque Nationale de France, and the New York Public Library. Images of the work to be exhibited are posted at gallerynaga.com.